Are you planning your dream remodel? Been thinking about fixing up your kitchen or bathroom for years, but just don’t know where to start? 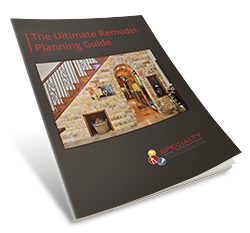 Our free eBook, The Ultimate Remodel Planning Guide will answer all of your questions. Hundreds of remodels and thousands of hours of working with our clients, listening to their questions and solving their remodeling problems have given us a unique insight and great experience that we are sharing with you in this one-of-a-kind eBook that lays bare the secrets of the remodel industry. Fill out the form on this page and gain instant access to this invaluable guide to planning your remodeling project.